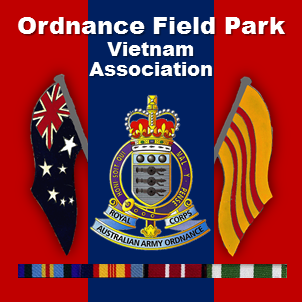 2009 – Adelaide SA – Ordnance Field Park Vietnam Assn. Although it was only twelve months since we met in Perth, we all gathered again for our special Adelaide reunion to remember all the good times we’ve had at our previous reunions, and to remember the person who made it all possible, Kathy Ault. As with all our other reunions, Adelaide was a great success, and you could just feel that Kathy had it all under control. Let’s not forget the other half of this very successful reunion team, Tony Flanagan. Kathy has trained Tony well and he is to be congratulated for ensuring everything went according to plan. The weather bureau had predicted a cold, wet and windy time for our reunion weekend and for once the bureau got it right……..Bugger !!! However we were able to dodge most of the showers and did not let the weather daunt us. Adelaide badly needed the rain so we were able to forgive them this time around. As usual the Meet & Greet proves to be a great start to our reunions. Adelaide was no exception. We welcomed two first timers who served with 6 OFP (Det) in 1967, Greg Quinlan and Harry Couper. Greg has been living in the USA for many years and Harry lives in Adelaide. Both are now confirmed ‘next reunion’ attendees. Local boys, John (Yogi) Heinze, Dave Chalker, Roger Nettle and his wife Joan, together with Queenslander George Crowe attended some of the reunion events. It was pleasing to see two of our ‘senior’ members, Ron Lewis and his wife Betty and Lawrie O’Neill and his wife Val, still attending our reunions. We must also acknowledge two special ladies who made it to Adelaide- Amy Chambers and Jan Stonehouse, wives of our deceased members Jack Chambers and Claude Stonehouse. Lou Fatone managed to contact Dave Sanderson who lives in Adelaide. Dave has been one of our ‘reluctants’ but showed up for the meet and greet. Word is that Dave was surprised at the number of guys who remembered him and that he will certainly give Canberra a lot of consideration. With Lou on his tail you can just about make it a ‘strong possibility’. Dave Peak got off to a good start by making a substantial contribution to the local traffic management branch. Seems like they don’t have such things as ‘parking regulations’ in Tamworth, so how was Dave to know you couldn’t park wherever there was a spare spot. Needless to say, our meet & greet went past the official closing time of 8.00pm, but then we weren’t about to spoil a great tradition that has been established over many reunions. The bar staff were great and look after us until toward the midnight hour. The first day of our reunion was a coach tour of the beautiful Barossa Valley commencing at 9.00am. Two tour buses duly arrived outside our hotel and everyone started to board for the days outing. About five minutes before departure it was noticed that we were missing a very important person (who shall remain nameless to protect his important status). A quick phone call soon brought this person into the correct time zone. Suffice to say, Tony’s military training had him shaved, showered, dressed and on the bus in ten minutes flat. Our buses took off in opposite directions so that we would not overload the sites we had planned to visit. Our day trip around the Barossa Valley, beside the wonderful country side and driving past wineries whose names we recognised, included a wine tasting at Langmeil Winery, a visit to Angas Park Fruits and a stop at Handorf German settlement to have a stroll around and a bite to eat. Our day was cool and showery but we managed to dodge most of the showers and arrived home late in the afternoon in time to get ready for our evening dinner. At 6.30pm we all gathered for dinner in the Hotel to continue on our conversations from the night before. Dawn Service at the South Australian National War Memorial commenced at 6.15am. We had a good attendance despite the previous night’s activities. A wreath was laid on behalf of our unit by Greg Quinlan. The showers held off right until the last moment, when we all headed off back to our hotel for brekkie and a tidy up ready for the big march. 9.00am soon arrived and we all gathered outside our hotel in preparation for the march. Surprise ! Surprise ! who should show up but none other that John Faram. Seems he was suffering from a deep guilt at not being at the reunion. Despite informing the local RSL that we wished to participate in the march, and getting their permission to do so, we found ourselves without a line-up place in the march. We soon worked out where we could fit in, in the line-up (in front of RAASC – we outnumbered them). As with all Anzac Day marches it’s ‘hurry up and wait’, which we did until it was our turn to go. This year we had a few of our ladies form up with us for the march. It was indeed good to see them, as our partners are definitely part of the OFP family. The weather was cool and windy, with showers threatening, as we took of on what was to become one of our longest Anzac Day marches so far. This year we were again led by the only officer who consistently shows up to our reunions, Alan Davis. Not long after we started marching our gallant banner bearers, Denis Blakey and Graham Ross, were struggling to keep our banner up in the windy conditions. The rain held off until just near the end on our march when a sharp shower blew over, just to remind us how lucky we had been in all our other reunion marches. After the march we all wandered back to our hotel for lunch and some more reminiscing. Sunday was a free day to do what we wanted and, where necessary, recover from the events so far. The tram trip to Glenelg proved to be a popular outing. Others checked out the local Casino, just across the road, whilst small groups could be found floating around the city. After a relaxing day it was time to gather, for one last time, in the Glenroy Room at our hotel for a combined farewell and dinner dance, which we dedicated to the memory of our late reunion co-ordinator and dear friend, Kathy Ault. Dinner music was once again provided by Dennis Flanagan, Tony’s brother. As has become the custom, Tony and Dennis sang a duet. We then danced the night away to one of Adelaide’s top bands “Brickworks”. During the evening Bob Nash made a presentation to Tony, on behalf of a grateful Ordnance Field Park Vietnam Community, in memory of our dear friend Kathy. The framed presentation included a poem, ‘Thanks for the Memories’, written by Lawrie O’Neill. Lou Fatone then presented Tony with an envelope which was a collection taken up during the reunion. Our hope was that this would help defray a lot of the unrecorded costs associated with organising our reunions over the years with perhaps a little left over for something special. Just after midnight we all had to say farewell again, until our next reunion. Word is that it will be CANBERRA 2011.